Have fun in one of my favorite food places in the world!! Talking about booze, don't forget to have a strawberry margarita at La Biznaga! 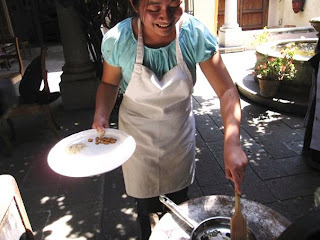 And the cooking class at La Casa de los Sobares is so much fun! Pilar is a great teacher!! hi there! nice to see a new post! wow, looks and sounds like you had a great trip. fyi - you ca get a flor de calabasa quesadilla at rana's (off the kenwood exit on the 94 freeway). that's not a common thing you can find in the mexican eateries here. and yes, they do use epazote in there as well.